Here is a primer on the custody issues involved in Foreign Service divorces and how to approach them. A Foreign Service parent, whether male or female, who seeks to take a child or children overseas in the case of an established joint physical custody situation or a new custody situation can be disadvantaged in the courts. Although laws regarding custody and divorce differ among jurisdictions, more often than not judges lean toward primary custody for the parent who is not moving. The non-posted parent can make arguments that overseas life is not good for the child; citing dirt and disease, crime and insecurity, unfamiliar culture and schools, and loss of friends and activities. In short, living abroad is unhealthy and unfamiliar and destabilizing for the child. An excellent argument that this is not true can, of course, also be made. But it is important to realize that jurisdictional laws place a high value on stability, and this is the principal barrier that needs to be overcome for an FS parent seeking custody. We offer the following concrete recommendations for actions to take and information to gather to establish your case, then discuss some of the legal considerations involved. Our recommendations are based, among other things, on the experience of one of the authors, who successfully changed joint to primary custody and moved overseas with her child in 2001. First and most importantly, make sure you are represented by a family lawyer who is familiar with the Foreign Service or “expat” way of life. If your (ex) spouse is represented and you are not, you are at a distinct disadvantage. Money spent on a competent lawyer is well spent. Further, hiring a lawyer enables you to distance yourself somewhat, emotionally, from the proceedings and allows the professional to help you make decisions. This is true even if you have a law degree and a practice. If you choose to represent yourself, depending on the jurisdiction, there are generally “self-help” centers in the court where you can get assistance to file motions and organize exhibits. These centers cannot, however, give legal advice. Laws regarding custody and divorce differ from jurisdiction to jurisdiction. But most venues recognize the “best interest of the child” as the determining factor in custody cases. This means that the judge will look at a dozen or more factors to determine what placement would be in the best interest of the child. These factors include the child’s wishes; the wishes of the parents; the child’s interaction with parents, siblings and others with whom he or she has an emotional bond; the child’s adjustment to home, school and community; potential disruptions to the child’s social and school life; and so on. Jurisdictional laws place a high value on stability: Disruptions, changes and distant relationships can make a strong case for the parent staying in the area. In addition, unless one parent is deemed unfit, most states’ laws lean toward the parent who is most willing to grant reasonable access to the other parent. Your willingness to offer fair and reasonably frequent visitation rights to the other spouse should be carefully documented, because this is often a key consideration in what constitutes a child’s best interests. 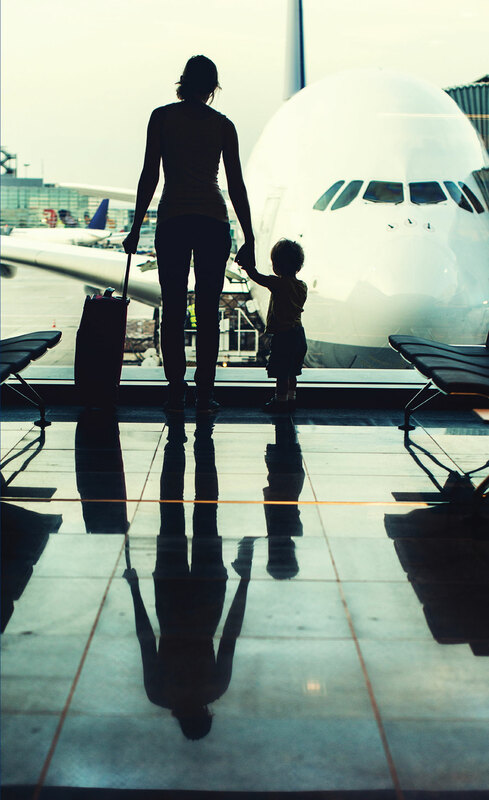 • You agree to pay for some or all of your child’s visitation costs (e.g., airfares), particularly if the child is close enough to go home for one weekend a month. • You accompany the child on the airline, especially at the beginning of the arrangement, or arrange for “unaccompanied minor” status with the airline (up to age 14). • You agree to send your child for almost all long holidays to the noncustodial parent (e.g., summer vacation, alternating Christmas and Thanksgiving), and make other efforts to ensure a fair division of time between both parents. • You facilitate your child seeing the other parent at post, should that parent wish to visit. • You facilitate interconnectivity through Skype, phone calls or emails. In our experience, the Foreign Service is generally helpful in working assignments that enable an FS parent to take a child under joint legal custody overseas if the FS parent is in the same or nearby time zone as the residence of the other parent (i.e., Canada, Mexico, Central America, the Caribbean) and within reasonable flying distance from Washington, without multiple plane changes. Similar time zones and reasonable distance are definitely factors that contribute to a favorable court decision. Here are some actions to take, arguments to make and information to muster to help demonstrate that your child will do well in a new environment. While you are collecting this information, you should work with your lawyer to make sure that each item meets the legal criteria for evidence, so that the judge will be permitted to review it in connection with your case. • Take pictures, if possible, of where you are going to live—the house, the neighborhood, the embassy environment. • Provide assurances that the school will send duplicate school progress reports/testing scores, etc., to the other parent. • Provide airline schedules and other reassuring travel information. • Agree to provide information in case of a travel delay of any kind, and be scrupulous in ensuring that the noncustodial parent is in the loop and minimally inconvenienced. • Agree to take the cat, the dog or whatever makes life comfortable for the child. • Provide pictures and information about the natural environment (e.g., parks, ocean) and give information about sports, music and extracurricular activities that are available to your child at the potential post. • Provide information about medical care and dentistry available while at post, and agree to provide all medical information and to consult on major issues should they occur. • Rather than destabilizing children, exposure to life overseas can encourage adaptability, engender more ability to cope with changing circumstances, and open them up to a better understanding of the world—all powerful life tools. • The Foreign Service experience benefits young people enormously when they apply to college. • On leaving friends: children in the United States move frequently and have to make new friends. Overseas, the embassy community can be like a village where you have a ready-made group of friends. Plus, in international schools, you meet children from diverse backgrounds who can remain close friends even when you move, thanks to the Internet. The State Department offers several allowances for children of Foreign Service families, some of which are pertinent for divorced or separated parents seeking custody. To understand these allowances, begin with the Family Liaison Office’s publication Divorce and the Foreign Service. Generally, the allowances pertain to education and travel for the child. More detailed information and post-specific information can be found on the State Department’s Office of Allowances Web page (http://aoprals.state.gov). Please note: most of these allowances apply only if the child is on the employee’s orders. And to be on the orders, the divorce decree must show that the employee has primary or joint custody of the child. Education allowances exist primarily to supplement education that is available in the United States and may not be available at post. This may include allowances for correspondence courses in, for example, U.S. history or government. Allowances for boarding schools may be available if the school at post is not adequate. However, if the child goes to a boarding school in the United States, and the noncustodial parent resides in the United States, the education allowance will not pay for the school. There may be an exception only if the noncustodial parent is unfit for some reason. Special-needs allowances and allowances for home schooling are also available. The education travel allowance will pay for one round-trip per year to post for the child who is in college or a post-secondary education program up to age 23. For children in grades 9–12, the education allowance may be used for travel to and from post. For a child to be on an employee’s orders, the divorce decree must show that he or she has primary or joint custody of the child. A child on the employee’s travel orders will receive the medical benefits available at the post. This may include evacuations for medical emergencies. If a tandem couple is divorced, the situation may be different. The child can only be on one parent’s travel orders. Custody may change according to the posting, the schools at post and whether one of the parents is on an unaccompanied tour assignment. The Foreign Service parent seeking custody should be familiar with the allowances so he or she can inform the judge about these means to enable the child to have a more stable life, even if living overseas. Once a party to a court proceeding collects information along the lines of the actions, arguments and information given above, each piece of information (including documents, photos, email messages, text messages and so on) must be entered into evidence before the judge may review it. In many cases, rules of evidence require that documents or records be authenticated, meaning that you may have to obtain either testimony or a certificate from an administrator before the document may be reviewed by a judge or moved into evidence. For example, a photocopy of a school record or a medical record may need to be “authenticated,” requiring either testimony or a certificate from a school administrator. For documents, you may have some in a foreign language that will need to be super-notarized or translated—or both. Your lawyer will know how to do this (although many good family lawyers are not accustomed to dealing with non-U.S. documents or languages other than English). Similarly, most courts require that each party to the court proceeding list his or her witnesses in advance and demonstrate why each witness is relevant to the hearing. Because these rules are complicated, your lawyer will take the lead in this process, and ensure that Rules of Evidence are followed according to the law of the jurisdiction. There may be a pre-trial conference during which all the physical and documentary evidence to be presented at trial is listed and presented as numbered exhibits, and witnesses must be named together with a preview of their expected testimony and how it proves your case. As a result, both parties will know what the other party will be using as evidence before the trial date. If you attempt to enter new evidence at the trial stage the judge may deny it. Expert witnesses may be needed. For instance, if the child has a learning disability or an allergy, you may need medical or educational testing experts to testify that his or her needs can be met at post. If you have a nanny you are taking with you, she may need to testify. If you intend to hire someone at post, you should be able to show that such caregivers are available and competent. Your lawyer will know how to qualify the experts or conduct a deposition and then move their testimony into evidence for the trial. A parent cannot be denied custody of a child merely because he or she does not earn as much as the other parent. However, the Foreign Service parent should be able to show that he or she can support the specific and potentially expensive arrangements that a long-distance relationship involves. This might include international transportation several times a year to the other parent and to extended family or close friends, private schools, after-school tutoring or sports or other activities, summer camps, household help and communications such as mobile telephones, or a Web-based telephone account like Skype, to ensure regular contact with the other parent. This evidence could be copies of your wage and pay statements, your income tax returns or the support considerations entered into at the divorce; all these should be moved into evidence. Also, if there were custody considerations in the original divorce decree that the (ex) spouse is now trying to modify, the original decree should be entered into evidence. In addition, it is important to work with your lawyer to ensure that you have the proper consent from the child’s other parent when you cross an international border. This consent can be something as simple as a consent letter; but it must be current and cover the specific travel that is actually occurring. In other words, if the itinerary changes and the consent letter no longer covers the actual travel that will occur, the other parent may need to be informed and asked to sign a revised consent letter. It is often useful to reach a general agreement about how consent letters will be handled in a joint custody agreement, or ask the judge to include such terms in a court custody order. As you are likely aware from your Foreign Service work, the consequences for taking unilateral action when traveling with your child or children are significant and could involve charges of child abduction or kidnapping. Susan Keogh was a political officer in the Foreign Service for 24 years, serving in New Delhi, Asmara, Quebec and Washington, D.C. After retirement, she worked for State on contract and as a When Actually Employed annuitant. Currently, she is on the staff of the Institute of Higher Studies at the University of Laval. She has been widowed and divorced, and is now happily remarried and commuting between Quebec City and Washington D.C., keeping up with work, eight children and 12 grandchildren. Ann La Porta followed her Foreign Service husband around the world for 38 years, working as a lawyer whenever she could, including dealing with Maori river rights issues in New Zealand and designing a Rule-of-Law program in Mongolia. She now volunteers as a guardian ad litem for children in contested custody cases in D.C. Superior Court. She lives close to her two grown children and enjoys being with her three grandchildren. Diane Holt followed her diplomat husband around Europe, working as a transactional and commercial lawyer in Central Europe and as a mergers and acquisitions lawyer for the former Italian electric monopoly, Enel. She and Ann met in Naples, Italy, when they began volunteering, first with the International Committee of the D.C. Womens Bar Association and then as children’s lawyers in the D.C. Superior Court. Diane now serves as editor of international and transactional law in the Bloomberg Law division of Bloomberg BNA.